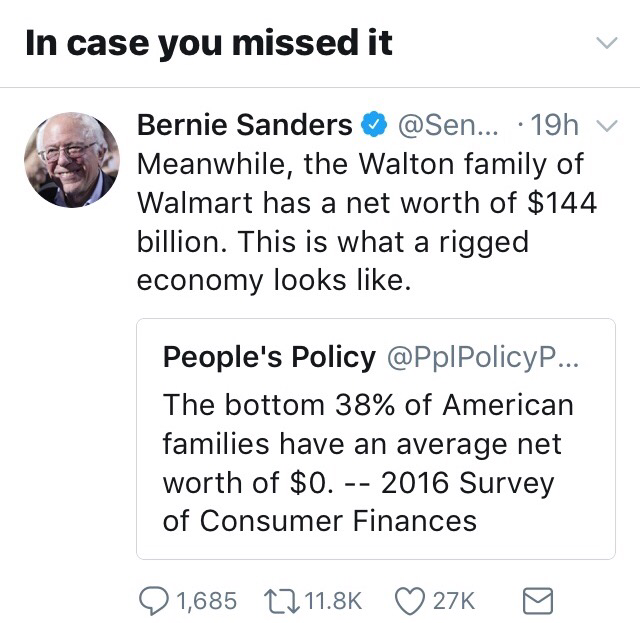 A rigged system, really Bernie? Let’s see, I start a small business, it starts to grow. I borrow money, take risk, expand and finally get to the point where I issue public stock and I give myself and my family millions of shares of stock. The company grows, the stock value grows over many years. We are rich! We are billionaires… and in the process we have created thousands of new jobs, lowered prices and stimulated the businesses of countless suppliers and made more millionaires. It’s very easy to sit back and envy a life’s work and success and then to criticize it as unfair and unjustified. That’s what losers do. People like Sanders who constantly shoot off their mouth, complain about everything that is not equal as unfair and accomplish little themselves, creating nothing and living off the income of others. This is not a rigged system, it’s a working system. If the bottom 38% of Americans have zero net worth it’s their own damn fault. Sure there are some who are in true poverty with nothing much but the assistance they receive, but there are many more who have no net worth because they are imprudent spenders, savers and borrowers. Nothing is rigged except their own priorities and life choices. Sanders blabber gives these folks another excuse to complain and point fingers at someone else as the cause of their state in life. The fact the Waltons or Gates or Buffetts of the world have billions has nothing to do with the fact others have little. All this is relative as well, should we also point fingers at the couple earning $250,000 compared with the family earning $30,000? What part of the system is rigged that allowed Gates or Jobs or Walton to start their industries and change the world? Sanders tweets are as dangerous and misleading as Trumps. Last year Sanders made over $1 million over $800,000 of it from book deals. Rigged? If you are going to live your life as a grasshopper you have no right to belittle the ants. But, at age 76 Sanders hasn’t even been able to manage his own finances very well. According to Sanders’ July 2015 personal filing, his assets were reportedly valued between $194,026 and $741,000 in his wife Jane Sanders’ name. Credit card debt between $25,002 and $65,000 was also listed in the filing. However, properties held by the couple — a condominium in Washington, D.C., and a home in Vermont — were not a part of the personal asset disclosure forms. The Motley Fool added the estimated values of these properties to the median of listed assets and their after-tax estimate and took out the median of the debt to reach $1.65 million in assets for the couple. On halving the figure, Sanders’ net worth stood around $800,000. While the NFL protests who knows what generalized grievances we ignore the real issues. Rich, did you REALLY write this or did your family?? From your other articles, it doesn’t sound completely you. I’ve been saying this since Obama started his re distribution of wealth that also flared up racism and civil disobedience. It riled up the masses. Then Bernie and Hillary came along on his coat tails. Just think of all the people in this country who might think up an invention that people want. Then it sells nicely, then they expand. They might become rich. Hopefully, if they do, they will also sponsor a charity or two or more. They do give jobs to others and benefits. They feed many people by this. But the Government has NO Right to take it and give it away to folks who don’t want to work. I read an article about back from the 50’s and 4o’s how people were all working, nationality, race, religion…..none of what’s going on today. In NJ, the average for folks on Welfare is 45,000 a year. There are so many working folks who don’t make that. The welfare rolls have gone crazy. Jobs are harder to get and I know several young people who work 2 or 3 jobs to make ends meet but they WORK. They don’t Whine. They pay their bills. I think the food stamps program is great and can help those working with low paying jobs make ends meet. that’s fantastic. As long as they follow the rules on what they can buy. I know in SC and NC the rules are very lax. Alcohol etc can be bought. NJ is stricter. Necessities should be the rule. There should be something also to help them buy paper goods like toilet paper and paper towels and cleaning supplies. We have to get away from this YOU OWE ME my life, and I don’t want to work for it attitude in this country. We need to throw out POLICTICAL CORRECTNESS and come back to normal values. Hate crimes have to stop. Free speech is guaranteed but what about our laws on Slander and Libel? What happened to them. The NFL has to be taught to respect our country. They said we have to honor them…why? what did they do for us??? one gets down on his knees and pretends to pee like a dog, others are arrested for domestic abuse, drug use, drunken abuses, dog fighting, fights in general. And they are setting an example for our young?